It's often said that first impressions are important. In the case of great hard rock and heavy metal albums, this is often true. This week Aaron and Chris pick out some of their favorite album openers. In this hour-plus episode, you'll hear great leadoff tracks from artists like KISS, UFO, Europe, Judas Priest, Metallica, Vinnie Vincent Invasion and much more! Back in October of 2013, Chris and Aaron had a brainstorm. They noticed that many people like songs from big albums by big bands but when those bands go “out of fashion” with the mainstream, they release some great work and much of that work gets ignored by the general music listener. The idea of Buried Treasure was born. This week Aaron and Chris present Buried Treasure II; a collection of great songs from some of your favorite bands that you may have missed from albums released after mainstream success faded. In this hour-plus show you’ll get cool tunes from Dokken, Thin Lizzy, RATT, Britny Fox, Dio and much, much more. Dig it! Dave Shirt, Nikos Tevelis, Cobras & Fire, David Alpizar, Rich Dillon, Matt Ashcraft, Brian Odermatt, Brad Kalmanson, Mike Davis, Miguel Nunez, Terri Green, Mike Stewart, Ryan Sessions, Aaron Baker, Robin Bennett, Robert DePasqua, Kal Hinz, Wayne Cross, Dan Chaput, Ian Wadley (Rock & Metal Combat Podcast), Bakko, Billy Hardaway, Trevor McDougall, Colin Francis, James Brendon Dunn, Justin Hayes, Joe Royland, Marc Alden Taylor, Gino Ames, Brent Walter, Matt Syverson (Paperback Rocker podcast), Warren Money, Rodney Dickson, Chad Pollock, Kai Velmer, Brian Knapp, Darren Parkin, Sit and Spin with Joe, The Riff of the Day, The Rockin’ Donkey. This week we fulfill an interview wish that goes back to the beginning of the show; fitting for our 4 year anniversary. This week Aaron and Chris celebrate the 4 year anniversary of Decibel Geek with an in-depth conversation with Mark Slaughter. Currently promoting his new solo album produced by Michael Wagener, 'Reflections in a Rearview Mirror' Mark was kind enough to sit down in-person with Aaron, Chris, and Decibel Geek writer Billy Hardaway for a long-form talk on the new album, the history of Slaughter, and A LOT of discussion about his days working with Vinnie Vincent in the Invasion. Aaron and Chris put out a call a few weeks ago for listener questions for Mark and the listeners did not disappoint. Many of the questions made it into the interview including one that Mark deemed his favorite. The solicitor of that question wins an autographed print of Mark from the photoshoot for his new album. The photo was taken by friend of the show and past guest Chad Lee of Chad Lee Photography. Be sure to listen to the end because Mark gives you another opportunity to win a signed photo if you can be the first to submit an answer to feedback@decibelgeek.com. The Decibel Geek podcast wishes to thank Mark Slaughter for his time and his openness to everything that was asked. Matt Ashcraft, Mike Stewart, Dave Shirt, Howard Tate, Billy Hardaway, Jeff Hogland, Wayne Cross, Justin Hayes, Colin Francis, Mike Blount, Marc Alden Taylor, Robin Bennett, Todd Cunningham, Joe Lascon, Shane Hebert, Ian Wadley (Rock & Metal Combat podcast), Warren Money, Sit and Spin with Joe, Wayne Newburn, Brian Knapp, Chad Pollock, Joe Royland, Podcasts Are The Best, hoops, MusiciMagsAndWax, Jack Broad, Daniel Chaput, RAW Magazine, Hot Metal Magazine, Faces Rocks Magazine. Aaron and Chris return this week to cover the second half of a very dark year in music and history. 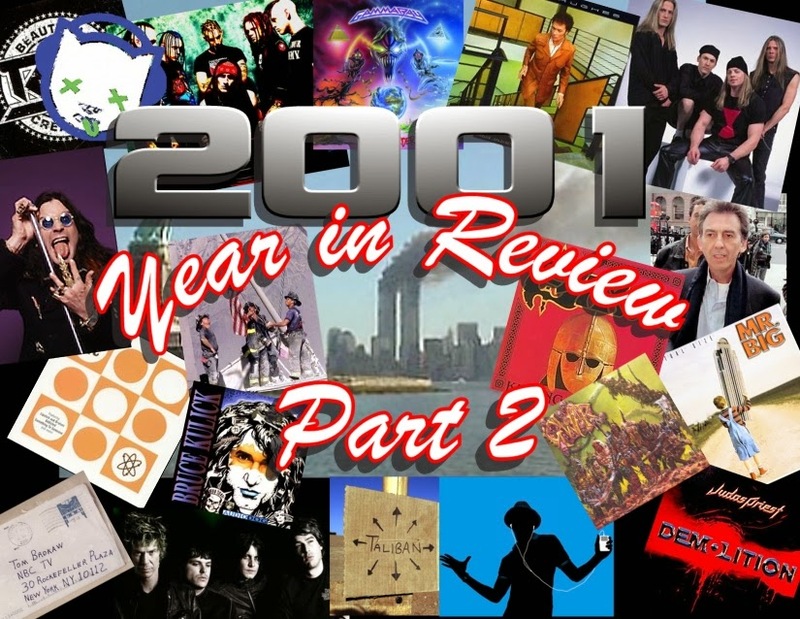 2001 Year in Review part 2 features more discussion of the pop culture, people, events, and music of July-December. In this hour-plus episode, you'll get discussion of the unveiling of the first iPod, the end of Napster, and the 9/11 terror attacks. You'll also get more classic commercials and tracks by artists including Saxon, Judas Priest, Mr. Big, Danger Danger, Beautiful Creatures, Gamma Ray, Bruce Kulick, and many more.